In theory, this outfit should have worked. 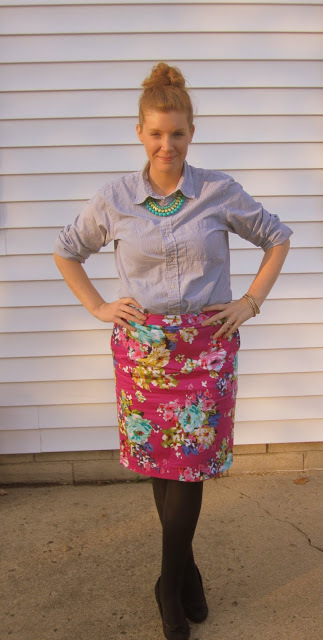 Menswear, floral skirt, statement necklace. Things I love. I’m not sure what happened, but this skirt, that I’ve only worn one other time, is now ill-fitting. I was uncomfortable in it all day. I think the shirt was just too bulky to be tucked in because I spent all day re-tucking. And these shoes are horrible for my feet. I first wore them to a wedding a couple weeks ago and regretted it big time. So, of course, it was an obvious next step to wear them to teach in all day. These things were all in my head as I wore this outfit and the pictures just confirmed my sneaking suspicion: this will not be worn again. Taking pictures of your outfits is helpful. What I see in the mirror and what shows up on film (okay, not actual film) are sometimes two different things. This whole dressing-myself-well is still a work-in-progress. And I’m always going to be a student. Anyone have a case of the Mondays? One way to solve that (or just avoid work for as long as possible because you know you want to…) is to head over to Texas Lovebirds and enter Carly’s giveaway. I’m giving away some goodies and so are a bunch of other lovely ladies. What are you waiting for?!? Go! No no no, this looks sooo cute!Seriously one of my favorite outfits so far!Isn’t it funny that something we think looks terrible,actually looks great to other people?I love everything about this look,so keep rockin it! You are so right; taking pictures of myself has made a lot of things that I thought looked good a little clearer, and usually not for the better. I think you are right about the fit issues with the skirt. I can’t imagine trying to teach all day in shoes that weren’t comfortable. I swear I’d be completely neurotic about getting shoes that fit. I think it’s super cute, but I always have problems tucking in my chambray shirt. It’s always kind of uncomfortable.